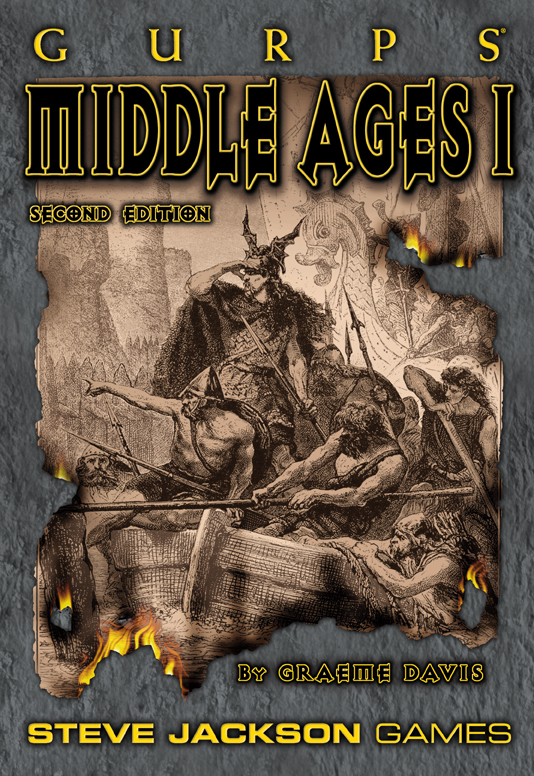 People have been writing about the Middle Ages ever since the Middle Ages. A reasonably complete bibliography would be bigger than this book. The sources listed below give a reasonable grasp of the world of the Middle Ages. Most of these books have bibliographies of their own. Brown, R. Allen. Castles from the Air (Cambridge University Press, 1989). Aerial photographs of just about every castle in England, with brief notes on each. Brown, R. Allen. English Castles (Batsford, 1962). A concise and digestible book with lots of plans and photographs. Burke, John. Life in the Castle in Medieval England (Rowman & Littlefield, 1978). A good source of information on running a fief. Forde-Johnston, James. Great Medieval Castles of Britain (Bodley Head, 1979). Probably the best introductory book about castles. Fremantle, Anne. Age of Faith (Time-Life Books, 1965). The High Medieval period in Europe. Gasquet, Cardinal (trans.). The Rule of Saint Benedict (Cooper Square Publishers, 1966). Gies, Joseph and Gies, Frances. Life in a Medieval Castle, Life in a Medieval City, and Life in a Medieval Village (Harper 1989, 1981, and 1991). Excellent descriptions of everyday life in three medieval settings. Combined into one illustrated volume as Daily Life in Medieval Times (Black Dog & Leventhal Publishers, 1999). Gottfried, Robert S. The Black Death: Natural and Human Disaster in Medieval Europe (The Free Press, 1985). A concise and readable account of medieval society across Europe, and how it was shaped by the plague. Hackett, General Sir John. The Profession of Arms (Macmillan, 1983). Includes a chapter on medieval warfare. Hardy, Robert. Longbow: A Social and Military History (Bois d'Arc Press, 1992). A complete history of the longbow, with a lot of supplementary information on medieval armies (and an appendix on making your own bow). Keen, Maurice. The Penguin History of Medieval Europe (Penguin, 1991). A concise and useful overview of major events and themes in medieval Europe. McCall, Andrew. The Medieval Underworld (Barnes & Noble, 1993). Covers all aspects of crime, punishment, the criminal classes and other social outcasts. Full of useful details for a gritty, low-society campaign. Matthews, John and Stewart, Bob. Celtic Battle Heroes (Firebird Books, 1988). A companion volume to Warriors of Christendom, below. Of the four heroes covered, only Macbeth is of direct relevance to this book; the color illustrations are a little disappointing, but the source material is invaluable for GMs planning action in Scotland or the borders in the 10th or 11th centuries. Matthews, John and Stewart, Bob. Warriors of Christendom (Firebird Books, 1988). A selection of Christendom's finest champions (including Richard I, naturally), with excellent illustrations. Also published as a series of four Osprey-sized softcovers. Myers, A. R. England in the Late Middle Ages (Penguin, 1971). Part 4 of The Pelican History of England, a good introduction to the period. Oxford Dictionary of English Place-Names (Clarendon Press, various editions). As well as providing a source of place names for a campaign area, this book explains their derivations and has a useful essay on place name formation, allowing the GM to produce new but authentic-sounding place names linked to geographic or historical features of the campaign area. Stenton, Doris Mary. English Society in the Early Middle Ages (Penguin, 1965). Part 3 of The Pelican History of England; recommended as an introduction to the Norman and early High Medieval periods. Tannahill, Reay. Food in History (Stein and Day, 1973). A definitive study from earliest chefs to modern times. White, Lynn Jr. Medieval Technology and Social Change (Oxford University Press, 1962). Covers military, agricultural, and mechanical technology. Very useful for settling arguments about what could and could not be done in a particular period, and full of inspiration for medieval "weird science." Some of White's arguments about stirrups and mounted warfare are controversial. Whitelock, Dorothy. The Beginnings of English Society (Penguin, 1954). Part 2 of The Pelican History of England; recommended as an introduction to the Saxon period. Wilson, David. The Anglo-Saxons (Penguin, 1966). A quick read, with many plates and illustrations. Most if not all of these works have been published in many editions through the years. The editions listed here are those used in the preparation of this book. Author unknown. Beowulf (Penguin, 1973). Lightly Christianized but a great source for Saxon adventures, very much in the tradition of the wilder Viking sagas. Author unknown. The Mabinogion (Penguin, 1968). A collection of magical tales from Wales, including some early Arthurian stories. A precursor, in many ways, to romantic-chivalric stories. Bede. History of the English Church and People (Dorset Press, 1985). Idiosyncratic and littered with internal inconsistencies, but still the best source on early Church history in England. Chaucer, Geoffrey. The Canterbury Tales (Penguin, 1966). A party of 14th-century pilgrims, representing many social classes, entertain each other with tales and poems on the way to the shrine of St. Thomas. This edition is a modern translation, but the original is not hard to puzzle out. Chretien de Troyes and others. The Quest of the Holy Grail (Penguin, 1969). Arthurian tales at their best – a must for a romantic-chivalric campaign. Froissart, Jean. Chronicles (Penguin, 1968). Hundred Years' War stories by a master raconteur, who collected them from participants. Geoffrey of Monmouth, The History of the Kings of Britain (Penguin, 1966). A wonderful mixture of history, legend, and plain fancy, all stretched almost beyond recognition. Would make an excellent setting for a fantastic campaign. Gerald of Wales (Giraldus Cambrenensis). The History and Topography of Ireland (Penguin, 1982). A 12th-century account of Ireland based on personal observation (and prejudice!). Filled with wonderful anecdotes, especially about miraculous places and events. A good source for a fantastic campaign. Gerald of Wales (Giraldus Cambrenensis). The Journey through Wales (Penguin, 1978). A first-hand 12th-century account of the country, with many observations on the way of life as well as anecdotes and accounts of miracles. Duggan, Alfred. Leopards and Lilies (Faber, 1954), Lord Geoffrey's Fancy (New English Library, 1975), and The Cunning of the Dove (Pantheon, 1960). Duggan has written some outstanding historical novels (in the strict sense – novelizations of history), set in the Classical world as well as the Middle Ages. The ones above are particularly recommended. Eco, Umberto. The Name of the Rose (Harcourt Brace Jovanovich, 1983). A murder mystery set in an isolated monastery against a background of rivalry and politicking between monastic orders. Howard, Robert E. Hawks of Outremer (Grant, 1979) and Sowers of the Thunder (Grant 1973). Howard, best known as the creator of Conan the Barbarian, wrote a huge amount of historical fiction, set in almost every period and locality. Of particular interest are his Outremer stories, including those above. Blood-and-thunder stuff in the best Howard tradition, these stories are recommended to GMs interested in high-action campaigns. Peters, Ellis. The Brother Cadfael mysteries, starting with A Morbid Taste for Bones. Representing a stark contrast to Howard's violent adventure stories, these stories are set during the civil war between King Stephen and the Empress Matilda. Many are available on video, with Derek Jacobi in the title role. Written under a pseudonym by a respected academic, the stories are full of legal and social detail, and are highly recommended. Scott, Sir Walter. Ivanhoe. This novel has been filmed several times (and made into a TV series in Britain, starring Roger Moore before the first James Bond movie was even thought of). 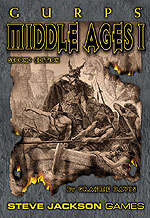 It is a classic slice of the Middle Ages as viewed by Victorian England. Jamieson, Evan; Meyer, Richard; and Stoddard, William H. GURPS Low-Tech (Steve Jackson Games, 2001). The definitive GURPS source on ancient and medieval technology. Marsh, Steven and Reed, Philip (compilers). GURPS Best of Pyramid, Vol. 1 (Steve Jackson Games, 2001). This book contains three articles of particular interest: Salvatore T. Falco's "Warrior Monks," on the military orders of the Crusades, S.A. Fisher's "Fire and Blood," on the nobility of the Middle Ages, and Matt Riggsby's "Low-Tech Economies." Howard, Dan. "Chainmail – Why Bother?" (Pyramid, September 14, 2001). A detailed examination of various types of historical chainmail. The Adventures of Robin Hood (Michael Curtiz, 1938). The film that, more than any other, defines the Hollywood Middle Ages. Army of Darkness (Sam Raimi, 1993). A good basis for an action-oriented medieval horror campaign. Black Knight (Gil Junger, 2001). A time-travel farce involving a theme-park worker sent back to the Middle Ages. The Black Shield of Falworth (Rudolph Mate, 1954). Runs a close second to Prince Valiant (see below) as the worst of the Hollywood Middle Ages. Entertaining nonsense about an orphan squire who discovers he's the son of a traitor and sets out to clear his family's name. Braveheart (Mel Gibson, 1995). Outstanding battle scenes, but history takes somewhat of a back seat to Hollywood. Excalibur (John Boorman, 1981). A dark, mystical, and dreamlike retelling of the King Arthur legend. Jabberwocky (Terry Gilliam, 1977). Once you get past the silliness, there are some telling observations on medieval life and society. A Knight's Tale (Brian Helgeland, 2001). The Hollywood Middle Ages meets the music video. Ladyhawke (Richard Donner, 1985). More of a fairy tale, with little in the way of historical accuracy, but still worth viewing. The Lion in Winter (Anthony Harvey, 1968; Andrei Konchalovsky, 2004). Especially recommended to those who like political wrangling rather than action. Monty Python and the Holy Grail (Terry Gilliam and Terry Jones, 1975). The ultimate silly medieval movie. The Name of the Rose (Jean-Jacques Annaud, 1986). More accessible than the book, and beautifully designed and photographed. Prince Valiant (Henry Hathaway, 1954). The Hollywood Middle Ages at its absolute worst. Henry V (Laurence Olivier, 1944; Kenneth Branagh, 1989). The Olivier version was made during World War II, and has weathered very well. In 1989 Kenneth Branagh put together an all-star British cast and made a very good version of the play. The battles are a little small, but both are worth seeing. Macbeth (Orson Welles, 1948). A very dark, brooding version (with a fairly convincing Scottish accent) which conveys the feeling of the play well. The BBC Television Shakespeare. The BBC has produced superb TV versions of many of Shakespeare's plays, using the full resources of its Drama Department. Most are available on videocassette or DVD. The Black Adder. The Wars of the Roses (an alternate version) are the backdrop for the rise of Rowan Atkinson's historic antihero, always just out of reach of power. Cadfael. Derek Jacobi has starred in adaptations of many of Ellis Peters' medieval murder mysteries, set in and around the town of Shrewsbury during the civil war between King Stephen and the Empress Matilda. Highly recommended for their visuals, atmosphere, and detail.